Veteran Bollywood actress Sadhana Shivdasani, better known Sadhana passed away today in Mumbai after a brief illness. She was 74. The yesteryear beauty, who enthralled masses with her graceful performances in Hindi films in the 60s and 70s had retired from public life long back. Born in Karachi in 1941, Sadhna studied at Jai Hind College in Mumbai before joining films. Though she played a cameo in Raj Kapoor’s Shree 420, it was the 1960 film ‘Love In Shimla’ which made her a household name. Her other famous films include Hum Dono, Asli Naqli, Mere Mehboob, Waqt, and Woh Kaun Thi. The actress also famously introduced the fringe hairstyle also known as Sadhna cut in Indian cinema. She was awarded the Lifetime Achievement Award by IIFA in 2002. Sadhana aspired to be an actress since childhood. Her father helped her enter films. In 1955 she played a chorus girl in the song “Mur mur ke na dekh mur mur ke” in Raj Kapoor’s Shree 420. When she was 15 years old, she was approached by some producers who had seen her act in a college play. They cast her in India’s first Sindhi film titled Abaana (1958), where she played the role of Sheila Ramani’s younger sister. She was paid a token amount of 1 rupee. Sashadhar Mukherjee, one of Hindi cinema’s major producers at that time, noticed her. She joined Mukherjee’s acting school along with her debutant co-star Joy Mukherjee, Sashadhar’s son. R. K. Nayyar, who had previously worked as assistant director on few films, directed this film. He also created her trademark look, called Sadhana cut, inspired from Hollywood actress Audrey Hepburn.The Filmalaya Production banner thus introduced Joy, Sadhana and her iconic hairstyle in their 1960 romantic film Love in Simla. The film was declared a hit at the box office and was listed in the top 10 films of 1960. Sadhana played the role of a simple, bespectacled girl who is transformed by her grandmother into a beautiful woman and encouraged to pursue the hero. 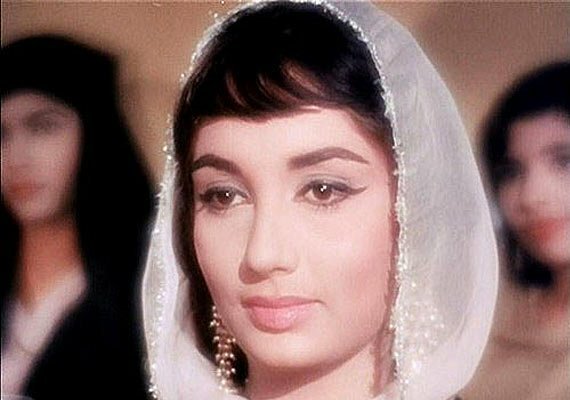 In the film, Sadhana wins a beauty contest and is awarded a three-year film contract with Filmalaya, which was the case in real life too. During this period she would again work under the same banner opposite Joy in Ek Musafir Ek Haseena. The Rafi – Asha duet “Abhi Na Jaao Chodkar” remains evergreen. In 1962, she was again paired with Dev Anand in Asli-Naqli by director Hrishikesh Mukherjee. The same year saw director-screenwriter Raj Khosla cast her opposite Joy in his musical film Ek Musafir Ek Hasina. Khosla would again work with Shivdasani to make their famous suspense thriller trilogy.